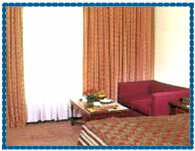 Hotel Holiday Inn Jaipur, Holiday Inn Hotel Jaipur, Reservation for Hotel Holiday Inn, Jaipur, India. Address: Plot No. 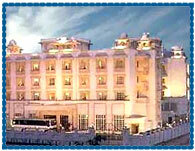 1, Golimar Garden Scheme, Amer Road, Jaipur  302002, Rajasthan, India. Accessibility: 18 kms. from Airport, 8 kms. from Railway Station, 10 kms. from Bus Stand. Hotel Holiday Inn is located at enterence of Jaipur, on the highway leading to Delhi, close to the Jalmahal Lake and the major tourist attractions of the city. The architecture of hotel is tradationally Rajasthani with a warm & friendly, traditional Rajasthani hospitality blended with international standards of service. Hotel offers 72 tastefully designed rooms and suites equipped with all the modern facilities like color TV, free morning newspaper, coffee/tea maker, mini bar, refrigerator and Internet. Outdoor Pool, Complimentary Breakfast, High-speed Internet Access, On-site Guest Self-Laundry Facilities (washer/dryer), Kids Eat Free, Iron / Ironing Board, Coffee Maker, Health/Fitness Center On-Site, Hairdryer, A/C Public Areas, Dry Cleaning Pickup/Laundry, Foreign Currency Exchange, Gift Shop, Newsstand, Porter/Bellman, Room Service, Safety Deposit Box available at Front Desk, Secretarial Services, Shoe Shine , Business Services, Courier Service, Facsimile, Printer, Private Limousine, Car Parking.